You are invited to join the first Monthly Call for the SF Bay Area educators network. Calls will be held on the first Tuesday of each month. The agenda for the call is attached. We are pleased to have as guest speaker: Steve Lawton, Pres. CWA Local 1102 in New York. https://www.siunited2018.org/ with 15 progressive groups and 140 attendees. The conference featured break-out sessions (Labor Rights, Immigration and Criminal Justice Reform, Environmental Justice) all with a local focus. Les Leopold gave a talk on Runaway Inequality to the large group (see tweet attached). On this call, we would love to get your ideas on the viability of doing a similar event in Santa Cruz (and/or elsewhere) in the August-September timeframe. We’d love to hear your success stories in helping others understand what you know about the causes and solutions for income- and wealth inequality. A meeting invitation will follow. Using Zoom videoconferencing, all you do is click on the link provided. I look forward to having you join us on the call. 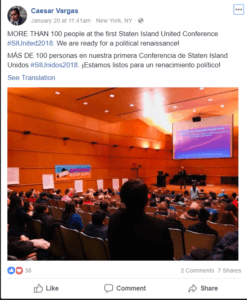 A proposed one-day event modeled on “Staten Island United 2018”. The event would feature 10-15 groups focusing on local Santa Cruz issues including Indivisibles, the Democratic Party, Democratic Socialists of America, immigration rights, criminal justice reform, housing rights, unions, students, Sierra Club, etc. It would include a 1- hour presentation to all groups/attendees on Reversing Runaway Inequality.